This tongue-in-cheek interpretation of a woofer is sure to bring not only sound to your ears, but also a smile to your face. 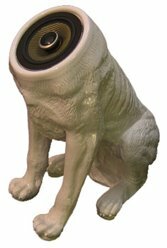 Created by Buro Vormkrijgers, a Dutch design studio founded by Sander Mulder and Dave Keune, this headless dog speaker system is available as a single woofer or a pair of stereo speakers. Also in the works is the Tweeter, a bird-like desktop speaker system. Check out this and other fun things on their website.